First published in 1996, The William Makepeace Thackeray Library is a collection of works written by and about the novelist. William Makepeace Thackeray spent part of virtually every year of his writing life in Paris and he wrote continually on France and French culture. 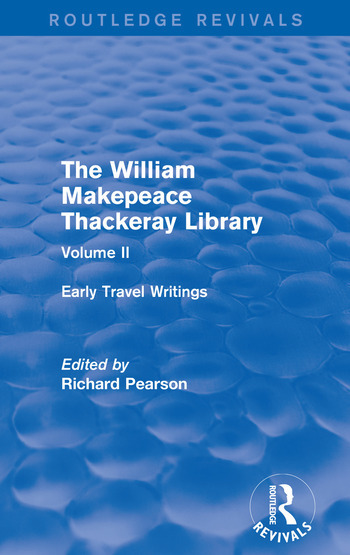 This volume contains a selection of Thackeray’s travel writing, the majority of which centres around his time spent in France, with the addition of some writing on his travels to Germany and America. With an explanatory introduction by Richard Pearson, this book reveals some of Thackeray’s lesser-known work which would later inform his novels. This book will be of interest to those studying Thackeray and nineteenth-century travel writing and literature.